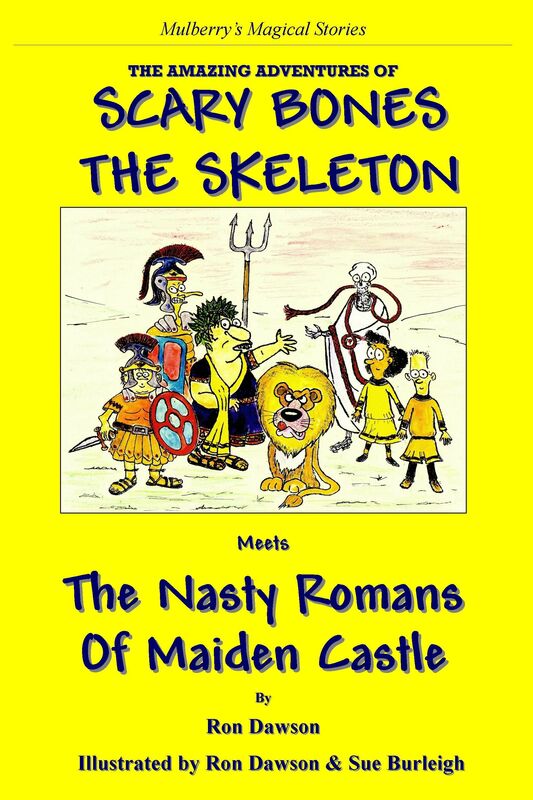 In this adventure, Scary Bones, Sasha and Ben are taken back to Roman Britain by Queen Do-you-see-her. Captured by Maximus and Minimus, two nasty Romans, they are given to the Roman Governor, Verymuch Ridiculous, the nastiest of nasty Romans, to fight Biggest Bullyus and Baddest Brutus, the nastiest of nasty gladiators, and Richard, a hungry red lion. Can Scary Bones and the Red String save their friends from certain death in the arena? . 'We love the Scary Bones’ stories. This one is fabulous.’ Joe 6 & Jack 11. ‘Whenever we read the stories together, we are spellbound in amazing worlds of fun, fantasy and great adventure!’ Tracy, their Mum. ‘A really different story using the familiar lovable characters. We liked how Scary Bones literally takes centre stage in this one!’ Fran, his Mum. ‘Another brilliant adventure. Freda (6) and Daisy(4) couldn’t wait for the next chapter each night! Visiting the places used in the stories is really fantastic; Maiden Castle here we come!.’ James, their dad. Pupils, Leehurst Swan School. Salisbury. The children identify with Scary Bones, Sasha and Ben and regard them as friends. The stories capture their imagination. They love the cliff-hangers in the stories and guessing what happens next. The use of actual places intrigues them. It makes the stories even more real, and provides opportunities for further learning and a broadening of their experiences. Their biggest accolade is when we finish a story; they immediately ask to hear or read another. (PS. Teachers enjoy the stories as much as the children!)’. Teacher, Anderton Park School, Birmingham. ISBN 978-0-9561732-6-3 RRP �4.99 All books ordered direct from Mulberry Tree Books are delivered with FREE Post and Packing ! If you would like your book signed by and with a message from the author please send your message to mulberrytreebooks@talktalk.net when you place your order.